A respectable look at a man and his talent. One of the most unique voices in rock music and arguably the greatest front man to grace the stage, Freddie Mercury has been hailed as a showman beyond compare and a decadent party animal, but beneath the glitz and glamour was a very guarded and enigmatic man. Unearthing previously unseen footage and vintage interviews, a new documentary from Eagle Rock Entertainment, appropriately titled Freddie Mercury: The Great Pretender, gives fans an opportunity to peer beneath the flamboyant stage presence and charismatic public persona of a rock legend and see the very private man who dwelt inside. It’s inevitable that any documentary on Queen is going to focus on Freddie Mercury. Whether you are listening to a recording or watching a concert performance or an interview with the band, Freddie’s gregarious persona practically reaches out and grabs you, refusing to let go. So instead of delaying or denying the inevitable, this film pushes the other fellows in the band out of the spotlight and focuses primarily on the creation of Freddie’s two solo albums, 1985’s Mr. Bad Guy and Barcelona, a 1988 collection of duets with famed soprano Montserrat Caballé. Constantly searching for new ways to express himself and his wildly varied interests, Freddie seemed to want to prove something to both himself and his fans with his first solo effort. The second was a labor of love and the fulfillment of a longstanding desire to work with a woman who possessed what he referred to as “the most beautiful voice on earth”. While neither album reached the commercial heights of his work with Queen (Mr. Bad Guy was an out-and-out flop), both serve as a showcase for a performer striving to experience art and life to the fullest. 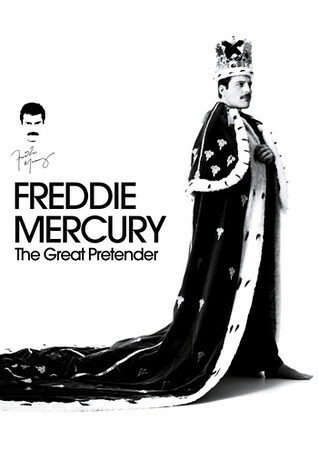 The Great Pretender not only gives us a glimpse into the recording processes for each album and Freddie’s thoughts on the folks he worked with, it also provides a few brief outtakes from never released songs including a duet with Rod Stewart and another with Michael Jackson. Frankly, I found this portion of the film - though very brief - to be almost worth the price of the Blu-ray. Hearing Freddie Mercury and Michael Jackson singing together for the first time was like the first time peanut butter and jelly decided to lie between two slices of bread. Amazing. Quite a bit of time - perhaps too much time - is devoted to Freddie’s collaboration with Montserrat Caballé. However, the extensive focus on this album is justified since Freddie considered it perhaps the most important work of his career. Shortly before the project commenced, he discovered he was HIV positive and perhaps because of this, found an enormous burst of creativity. The album, like much of his output, was something completely original: a combination of opera and pop music. Critics didn’t know how to react, but the album was a hit. Of note is the fact that Pavarotti slammed the album, saying that it “dumbed-down opera”. Years later, he would famously duet with Bono, Bryan Adams and Bon Jovi, so I guess Pavarotti is a big fat jerk while Montserrat Cabballé was ahead of her time, huh? While I am more than happy to volley insults in the direction of world famous singers, Freddie Mercury: The Great Pretender avoids much of the scandalous topics that one might assume would dominate a documentary of its sort. It is admirable that the filmmakers didn’t wish to sling any mud and instead chose to focus on the musical talent of the man rather than the salacious details of his personal life. Their decision somewhat limits just how in-depth of a look we are allowed. That’s not a complaint, merely an observation. But if you’re looking for tabloid sensationalism, you may wish to look elsewhere as this film presents a respectable look at a man and his talent. Which is not to say that there isn’t a bit of detail on the personal life of Freddie Mercury. An intensely private man, he overcame shyness and concerns about bad skin or his teeth to become a true superstar. Freddie Mercury: The Great Pretender paints a compelling portrait of a man who could be an extreme extrovert on stage and a near recluse away from it, complete with anecdotes and discussion from those who knew him best. Although this documentary may not hold a lot of appeal for casual fans, it struck me as a must-have for diehard Queen fanatics due to the amount of rare footage including video outtakes, interviews, and even a few outrageous clips from Freddie’s fabled 39th birthday party. The Blu-ray is presented in 1080i High Definition Widescreen 16x9 (1.78:1), so for the most part, it looks amazing. That said, a small portion of the footage is old and therefore a bit grainy, something which I presume could not be helped. In no way does it distract from the quality. The audio is LPCM Stereo and it sounded great. And it should sound great, right? I mean, when you’re doing a documentary on a musician, it really ought to sound wonderful. And this one does. There are a few extras that basically just amount to extended versions of the interviews conducted here. They’re worth the time, especially if you are a huge fan. And why would you buy this if you weren’t?